The Ansell TouchNTuff 93-300 Disposable Long-Cuffed Nitrile Gloves are thin nitrile gloves that provide flexible and comfortable protection against a range of chemicals. Featuring textured fingertips, these latex-free, single-use gloves provide excellent gripping ability that increases control and reduces hand and arm fatigue. As a result, these gloves are suitable for a wide range of applications in the pharmaceutical and life sciences industries. Manufactured from thin nitrile, the TouchNTuff 93-300 Gloves are flexible in nature, providing excellent dexterity and a high level of comfort. Due to their formulation, these gloves offer three times the puncture resistance of standard latex gloves, and provide a higher level of protection against a wide range of chemicals than any other single use nitrile gloves. 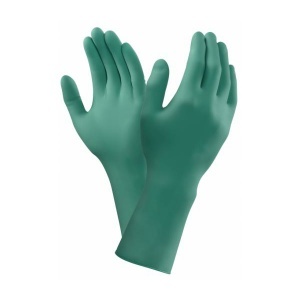 These gloves are completely latex-free, meaning that they don't contain any natural rubber latex proteins. This makes them suitable for individuals with latex allergy and reduces the risk of allergic reaction in other users. The Ansell TouchNTuff 93-300 Gloves are available in a choice of sizes, making them suitable for most users. Please consult the table below for details, then select the required size from the drop-down menu at the top of the page. The gloves have a thickness of 0.12mm and a length of 300mm.